Indonesian Minister of Environment and Forestry Siti Nurbaya Bakar visits CIFOR. 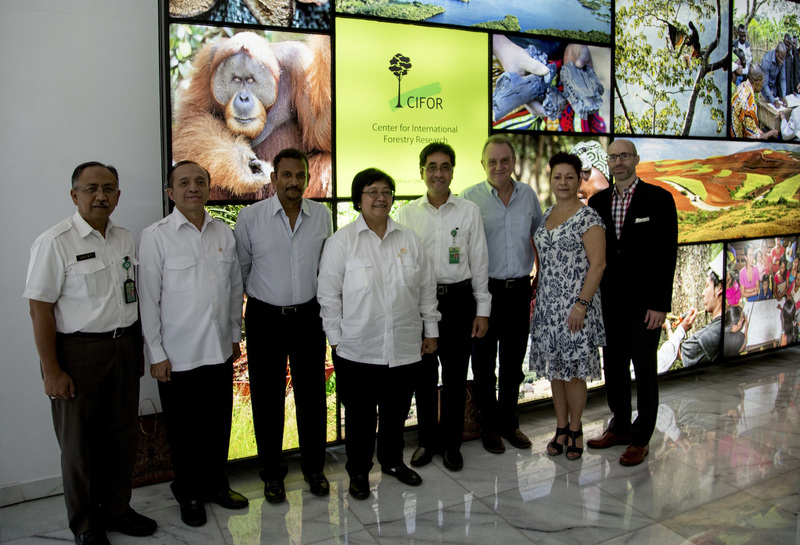 The Center for International Forestry Research (CIFOR) welcomed Indonesian Minister of Environment and Forestry Siti Nurbaya Bakar at its Bogor headquarters to discuss greater collaboration between the government and the research institute. Palm oil, peatlands, social forestry – areas where CIFOR does extensive work – and wildlife habitat conservation were areas of great interest to the Indonesian government, said Minister Nurbaya, adding that these were dynamic areas with many aspects that went beyond forestry, such as community livelihoods, businesses and international factors. With overlapping interest in research areas, the minister said greater collaboration, particularly to develop scientific aspects, would be useful, and that future discussions about how to evolve the long-standing relationship between Indonesia and CIFOR should take place. Christopher Martius, CIFOR Climate Change, Energy and Low-Carbon Team Leader who attended the meeting, said CIFOR could contribute to all of the areas the minister mentioned thanks to its long history of working with Indonesian research partners and vast international networks, which could connect with expertise that is beyond what is found in CIFOR. One area of solid collaboration that Minister Nurbaya pointed out was events, including the upcoming Asia-Pacific Rainforest Summit (APRS), where Minister Nurbaya is scheduled to be a keynote speaker. The Government of Indonesia is hosting the event, in partnership with Government of Australia with support from CIFOR. Research, Development and Innovation Agency of the Indonesian Ministry of Environment and Forestry Director General Agus Justianto and Ministry of Environment and Forestry Secretary General Bambang Hendroyono also joined Minister Nurbaya for the visit and discussion.